Imagine you're standing in silence, looking at the aftermath of end of the world; unsure of what to do next. Out in the middle of the black rock desert during a mild dust storm. isolated burn barrels left over from the prior nights festivities sit abandoned. The only sound you hear is a quiet pinging of the metal in the barrels as the heat of previous night's fire slowly dissapates. As the dust storm approaches you begin to feel a warm breeze blow against your cheek; suddenly you realize there is nothing left for you here. 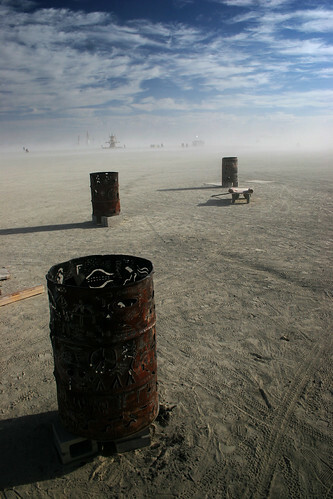 This was taken at the 2006 burn on Sunday morning about 20 minutes after sunrise.